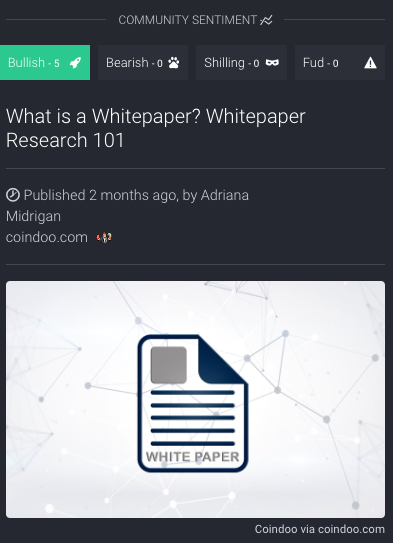 Coinspectator - The largest Crypto Whitepaper Database! With their tool you can quickly act on the latest crypto news, market volatility, investment tips, ICO launches, projects milestones etc. So How to filter information? To avoid getting blown-away by the amount of information their reproducing, you can use some filters to zoom in on the content of your interest (see image below). You can filter by ‘Latest News’ & ‘Top News’, but also on ‘News’ and/or ‘Blogs’. But the easiest is to use the search bar to filter down to specific content of your interest, such as news about a certain coin. You can also collapse the filters if you want more screen space and use the arrow keys on your keyboard to navigate the website. Apart from the title of the news-source, they are also showing an excerpt of the underlying source & the usual information such as credits to the original author and date of the post. Navigating the website with the arrow keys is especially useful when you have you filters set up properly, since you can just navigate down and scan all the excerpts of your interest. They have some nice attributes you can give to posts, such as ‘Bullish’, ‘Bearish’, ‘Shilling’ & ‘Fud’, which they rightfully call ‘community sentiment’. They also show when a post is ‘hot’ (trending story) and you can always give a thumbs up or down for certain headlines.